On this RCC session, we met a member of the LES Ecology Center who led a tour of the organization’s compost operation in East River Park. 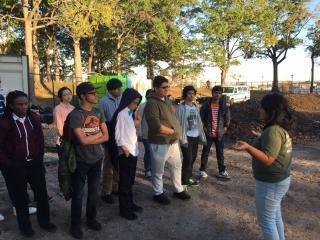 This gave the students an opportunity to see the difference between our small-scale compost collection at Inwood Hill Park. Students assisted in compost maintenance work and then loaded the van with tools and bags of compost to bring to four bald cypress street trees on Delancey Street. We weeded and cleaned up around this series of street trees before applying the compost to the beds. This work was rewarding to the students to see the results of their hard work in cleaning up the tree beds. The field trip also served as a useful means to discuss the benefits that street trees provide in the city environment.